Greetings! : Recently we celebrated the birth of the Mother of our Redeemer, Jesus Christ. This reflection as seen from the eyes of the Mother of the Redeemer, the Blessed Virgin Mary. Please refer to the: INTRODUCTION if you are a first time reader, as it explains the origin of the reflection below. AFTER GOD HAD CREATED Mary’s immaculate soul, He showed it to the choirs of angels in heaven, and they felt intense joy upon seeing its unique beauty. Then, as Mary’s soul was infused into her body, her holy mother, St. Ann, was filled with the [Holy Spirit] and experienced an extraordinary devotion and happiness. Throughout rest of her life, and especially during the next nine months, she constantly received new graces and enlightenment concerning the great mystery of the Incarnation, and frequently praised the Lord in canticles of love. 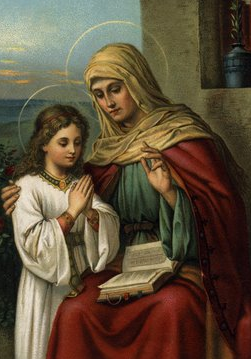 However, in order to increase her merit, God allowed St. Ann to undergo grievous trials during her pregnancy… Satan did not know that her daughter was to be the Mother of the Saviour,… [but] he did his best to tempt and disturb and harm her… she resisted all his attacks with humble fortitude, patience, and prayer. St. Ann, mother of Mary, pray for us! Next, Satan incited some of St. Ann’s women friends to treat her with open scorn and mockery because of her late pregnancy. St. Ann did not permit herself to be upset by this injustice, but in all meekness and humility she bore the insults and acted with still greater kindness toward these women. Early in September, St. Ann was informed interiorly by the Lord that the time of her daughter’s birth was near…she sent for three of her closest women relatives…When she told St. Joachim, he rejoiced and went among his flocks in order to choose the finest lambs, goats, and bulls, which he sent to the Temple in care of his servants as an offering of gratitude to the Lord. One evening the three women arrived and embraced Ann, congratulating her warmly. Standing with them, she poured forth her deep joy and thankfulness in a beautiful spontaneous canticle,…St. Ann prayed until nearly midnight…While she was praying thus, a supernatural light began to fill the room. Noticing it, the three friends threw themselves onto the floor and hid their faces in awe. So the dazzling light entirely surrounded St. Ann, making her invisible. God gave her to understand that she was to bring up her daughter with all motherly love and care but without outward show of reverence, while retaining inwardly profound veneration for the future Mother of the Messiah. Later St. Ann retired to her room and lay down on her bed with her baby in a little cradle next to her, and St. Joachim was called in. The holy old man knelt beside the bed, deeply moved at the sight of this lovely daughter for which he and his dear wife had waited and suffered for twenty long years. While warm tears flowed freely down his cheeks, he carefully took the baby in his arms and sang a fervent hymn of praise to God. The next day many friends and neighbors of St. Ann St. Joachim came to see the baby and congratulate the happy parents. Everyone was deeply touched upon seeing little Mary lying in her cradle, wrapped in her red and gray swaddling clothes, and there was general rejoicing. As we continue to pray and prepare for the coming of God – Jesus Christ – both into our hearts and in to human flesh, may we ever be mindful of the privilege and power that God has given to His Mother. Especially we our society so frequently abuses her name and virginity. PRAY for those who wound God so closely with their words of ignorance and hatred! It is they who will receive much justice at the hand of the Returning King. Pray for US SINNERS, now and at the hour of our death. Amen!